Visitor and Interpretive Center, while a new Center is being built. (exact date is uncertain). Its appearance has changed since it was first built. Fermamdez e Lineros in 1866; then to Rene Beauregard in 1880. Rene (son of Gen.
decline and was unlivable when the National Park Service purchased it in 1949. 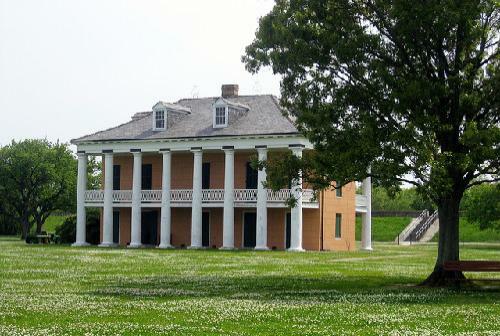 Revival grew in popularity in Louisiana, many houses were renovated in that style. The restoration of the home has stressed the mid-1800's period of its history. when this photograph was taken in 1890.
above and the two below were taken in the 1930's. Above, front; below, rear of house; notice the cistern on the right below. and restoration occurred in the late 1950's. 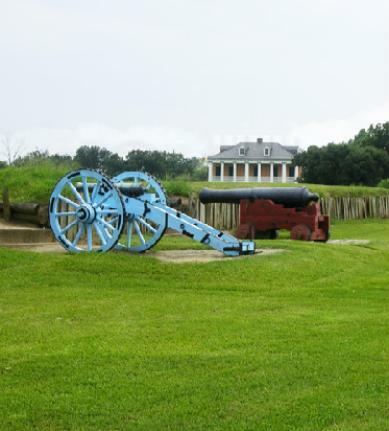 and Jean Lafitte National Historical Park and Preserve.